The Caribbean stands out in the popular imagination as a 'place without history', a place which has somehow eluded modernity. Haiti is envisioned as being trapped in an endless cycle of violence and instability, Cuba as a 1950s time warp, Jamaicans as ganja-smoking Rastafarians, while numerous pristine, anonymous islands are simply peaceful idylls. The notion of 'getting away from it all' lures countless visitors, offering the possibility of total disconnect for the world-weary. 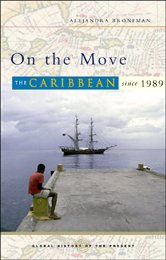 In On the Move Alejandra Bronfman argues that in fact the opposite is true; the Carribean is, and has always been, deeply engaged with the wider world. From drugs and tourism to international political struggles, these islands form an integral part of world history and of the present, and are themselves in a constant state of economic and social flux in the face of global transformations.